‘Sometimes theatre is so full of life that one can call it a true rebirth of the theatre. Over three thousand people attended the first production of The Kingdom, and a greater number went to see the opera on its tour of Holland - all performances were sold out, apart from in The Hague. I based The Kingdom on Alejo Carpentier’s account of the Haïtian Revolution, The Kingdom of This World. Inspired by surrealism, Carpentier’s idea of ‘magic realism’ first appeared in his famous introduction to this novel. After completing the libretto, I visited the historical sites in Haïti where the events shown in the opera took place. I learned from a master-drummer in Cap-Haïtien the complex polyrhythms of traditional Haïtian dance forms. in the pre-colonial nations of western Africa. In their Haïtian forms and in my hybrid variations, they form the backbone of the music I composed for The Kingdom. of African and European traditions. The opera is scored for choirs, instrumental ensembles, and electro-acoustic tape. of thirty-five. Over sixty people were involved in the production. 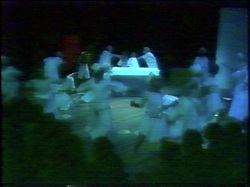 the DNA music, theatre and dance company was set up from this production. The film of the Amsterdam production, together with other documents, are now in the University of Amsterdam's Library, in its Special Collections section. * this research trip was described in my book Haïtian Summer (1984).